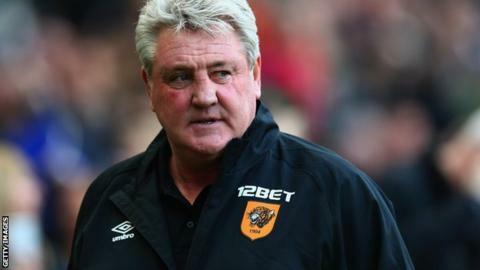 Hull players will take a wage cut of up to 50% if the club is relegated from the Premier League this season, says manager Steve Bruce. Bruce's side are 17th in the Premier League with six games left and out of the relegation zone by just one goal. "The club has a strict policy that if we do get relegated then we don't fall into drastic times," Bruce said. "Everybody concerned takes a huge reduction in salary, and most players take a 40% or 50% reduction." Hull have to play four of the top six in their run-in - Liverpool, Arsenal, Tottenham and Manchester United. They travel to Crystal Palace on Saturday (15:00 BST) under increasing pressure from Leicester, who have won three games in a row to pull level on points with the Tigers. Bruce said Hull had made "sensible provisions" in case of relegation. He added: "We've worked so hard to get in the league and then stay here last year, and the players realise the situation we are in."